I love presents! Not only do I love receiving presents, but I love just decorating with them. 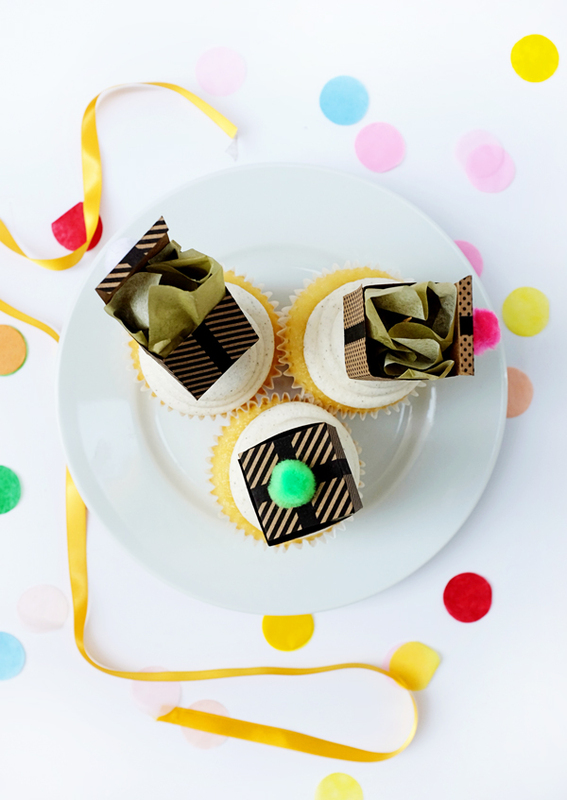 These gift box toppers are so cute and such a fun new way to decorate your holiday cupcakes. 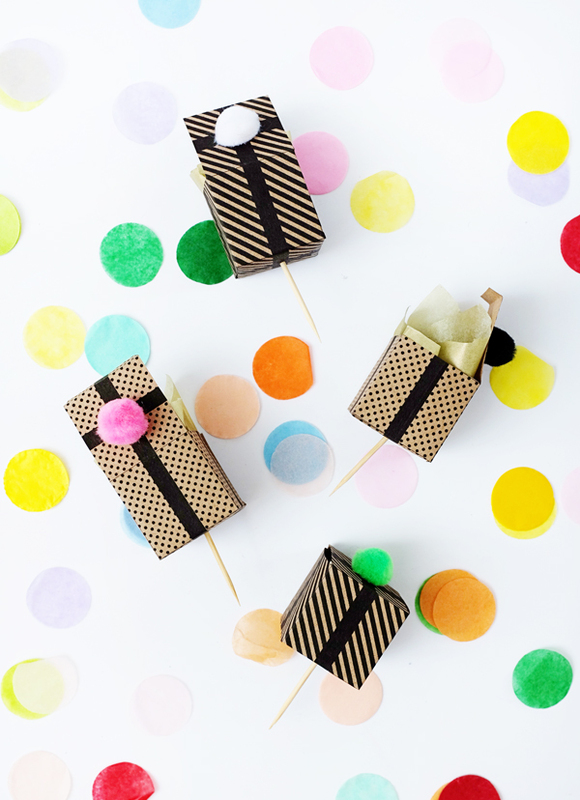 They are easy to make and a perfect way to get excited for the holiday season! 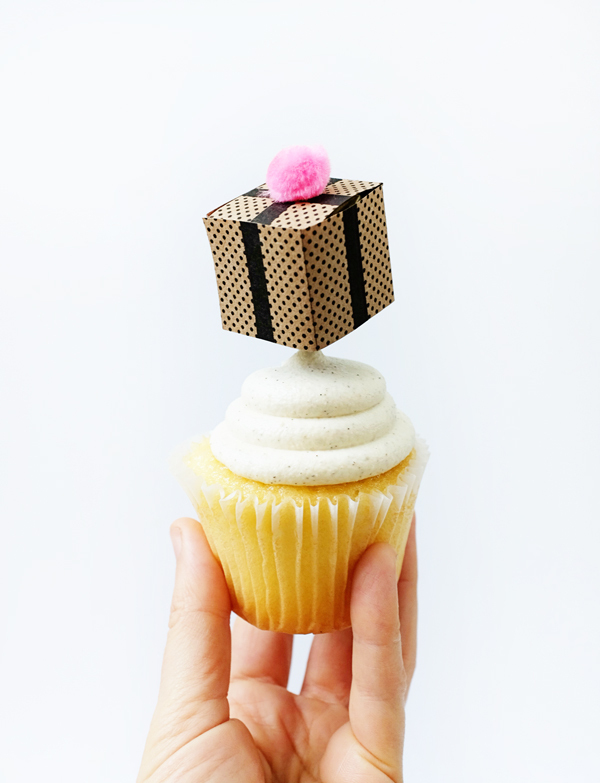 Materials: Printable gift box cupcake topper template, 8.5 x 11 kraft paper (a larger size works too if it fits in your printer), craft knife, ruler or straight edge, scissors, glue, 1/16 inch hole punch, toothpicks, small pom pom. 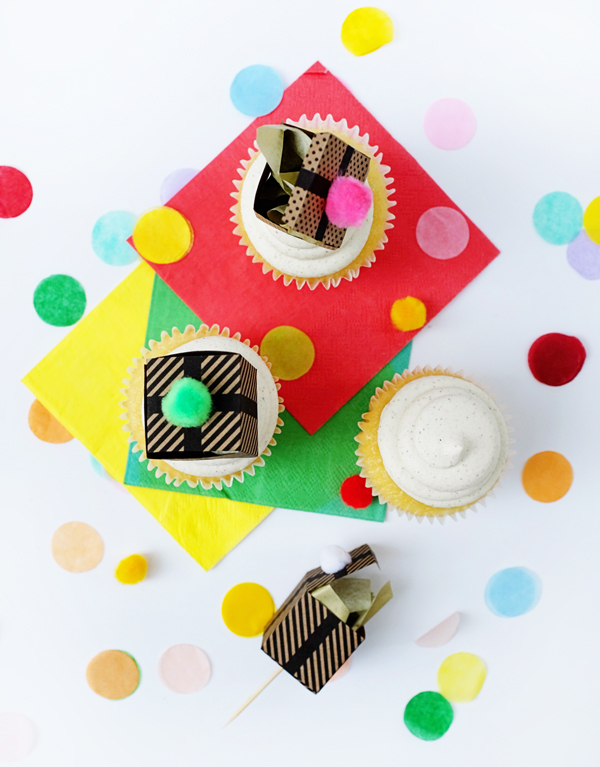 Step 1: Print out the Printable gift box cupcake topper template on 8.5 x 11 kraft paper. Step 2: Cut out template with the craft knife & straight edge. Step 3: Fold the box along all of the indicated fold marks. Step 3: Make a hole in the center of the bottom of the box using the hole punch (see picture). 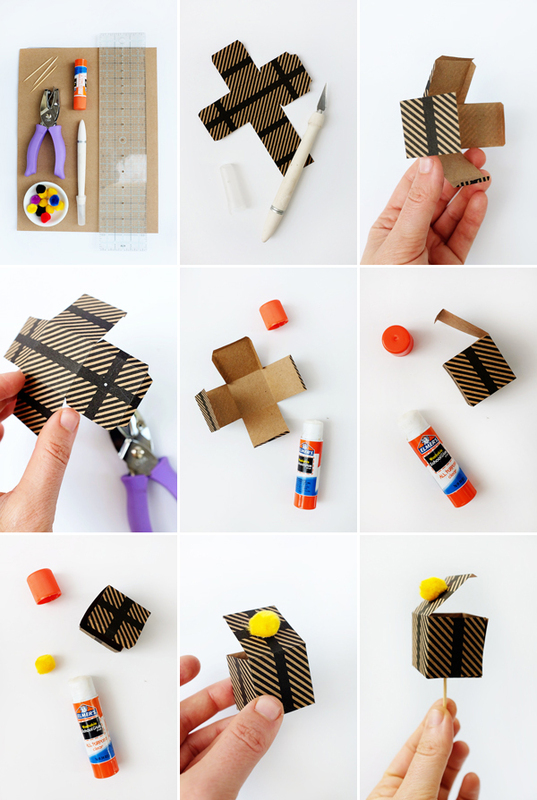 Step 4: Apply glue to the 3-tab bottom & side tab of the box. Don’t apply glue to the single-tab side opposite the 3-tab side. That will be the top of the box. Step 5: Assemble the box and wait for glue to dry. 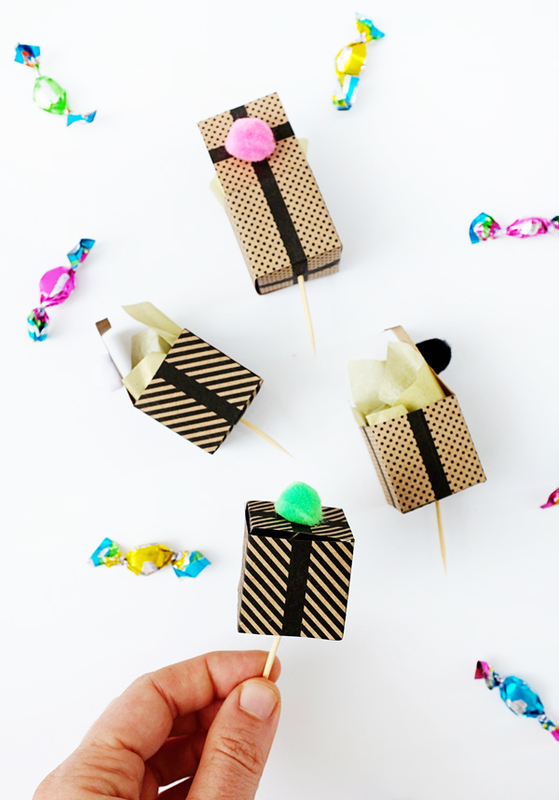 Step 6: Apply a bit of glue to a pom pom and press on the top of the box. Let dry. Step 7: Stick the toothpick through the bottom of the box in the previously punched hole. 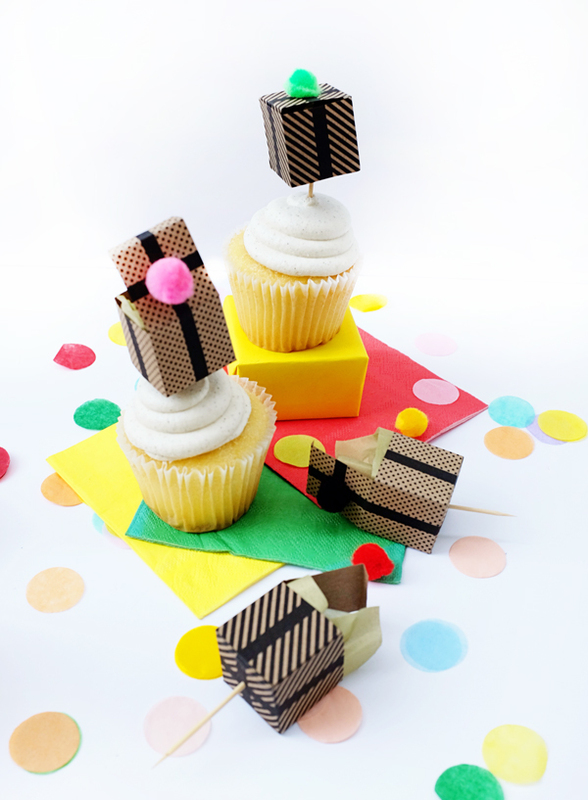 Step 8: If you want, put a little bit of tissue paper in the box then put the topper on a cupcake! This is adorable!! I’m obsessed! How cute are those? And you can even put something in the boxes!